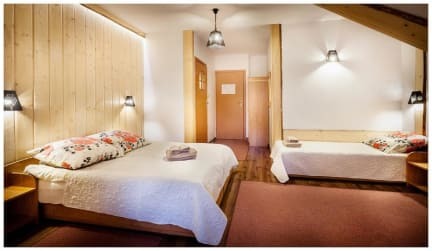 Guest House Tatrzanska Kotwica is located 12 km from Zakopane, 4 km from entrance to Tatra National Park and 8 km from National border with Slovakia. It's also close to Chochołowskie Termy hot springs 3,5 km, Aquapark Oravice -12 km. Chocholow wooden village- 4 km. Cosy room for 2, 3, 4 or 5 person. Rooms have TV, private bathroom and view on the ski lift. We also offer breakfast and/or dinner. Free WiFi access is available throughout the property. There is also free private parking.